Today’s program is the latest show from JustAFansView.com and talks about NASCAR from just a NASCAR fan’s point of view. It can also be found at NascarFansView.com It is another regular production of PodCastNorm dot Com. In it, Rusty gives his opinion of the drivers, races and racing in the NASCAR Sprint Cup Series. This episode talks about the race in the Chase at Chicagoland Speedway which is the first opportunity for drivers by winning to move forward into the next segment of the ten week Chase for the NASCAR Sprint Cup. These article/podcasts are generally weekly podcasts during the NASCAR season. Rusty is a former hometown Stock Car driver and owner and his passion and love for the sport is evident as he shares his take and opinion of the NASCAR Sprint Cup Series as the Season progresses from the season beginning at Daytona in February and ending with the Championship at Homestead, FL in November. This episode talks about the race at Richmond International Raceway which is the last opportunity for drivers to qualify for the Chase for the NASCAR Sprint Cup. These article/podcasts are generally weekly podcasts during the NASCAR season. Rusty is a former hometown Stock Car driver and owner and his passion and love for the sport is evident as he shares his take and opinion of the NASCAR Sprint Cup Series as the Season progresses from the season beginning at Daytona in February and ending with the Championship at Homestead, FL in November. Today’s program is the latest show from NASCARfansview.com and that talks about NASCAR from just a NASCAR fan’s point of view. 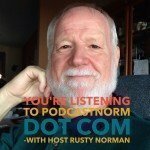 It can also be found at JustAFansView.com It is another regular production of PodCastNorm dot Com. This episode talks about the race at Darlington on this 2015 Labor Day weekend. These are generally weekly podcasts during the NASCAR season. Rusty is a former hometown Stock Car driver and owner and his passion and love for the sport is evident as he shares his take and opinion of the NASCAR Sprint Cup Series as the Season progresses from the season beginning at Daytona in February and ending with the Championship at Homestead, FL in November.